The 10 Best Taco Places in Wisconsin! Mexican restaurants, small joints, and food trucks across the state of Wisconsin are whipping up some seriously good tacos. These eateries have stolen the hearts of Wisconsin locals and visitors alike. Whether you’re looking for a sit-down style meal or something on the go, Wisconsin has you covered. Here are the 10 best taco places in the state! Some of the best tacos in town are served up at Taqueria Buenavista. They have a cozy little joint with limited seating, making it even more special. There are tons of taco and Mexican dishes on their menu. Check out why Taqueria is loved by Milwaukee residents. Dubbed the best place for “Tacos, Tequila, and Fun.” Choose from burritos to taco platters Tex Tubb’s has tons of dishes on their menu for everyone. They even offer vegetarian options. Check out their charming restaurant and enjoy some authentic food. Habanero’s Mexican Grill uses organic ingredients to bring you some of the best tasting tacos in the Madison area. Check out their authentic Mexican tacos used with the finest ingredients. 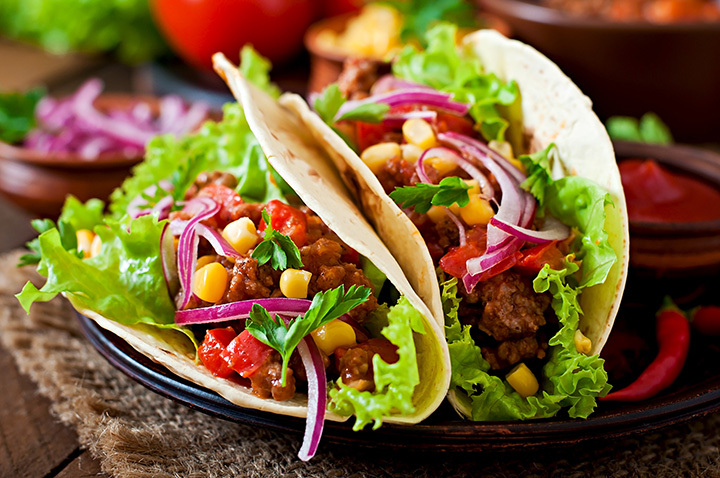 Choose between a soft corn or flour tortilla and your choice of meat, salsa, and sour cream. Bel Air Cantina is a great place to sit down with the family or enjoy a night out with your friends. In terms of libations, they offer over 100 different choices of tequila, along with their famous weekly drink special. Pair that with their extensive taco menu that will keep you full and satisfied. Gordo’s Food Truck drives around the Eau Claire area serving up some of the best tacos in the area. Their mobile Latin cuisine offers a fun environment for their loyal customers. If you are looking for affordable yet fast cuisine in the Eau Claire area—you have to check out Gordo’s Food Truck. If you’re looking for a friendly atmosphere, greats service and tasty tacos—look no further! The Munch Bar & Tacos in Hurley will take your taco taste buds on a trip. Take Taco Tuesday to a whole new level by grabbing your friends, a drink, and a few tacos at the Munch! Taco Burrito is a casual place for any and all taco lovers. Choose from chicken, steak, pork, sausage, and vegetarian options to build out the perfect meal. Order in or carry out to spend the night how you’d like. Be sure to check out their combo meals for even more added fun! El Mez is the perfect place for some Mexican cuisine in the Minocqua, Wisconsin. Load up on chips and salsa while you look over their lengthy menu. Their friendly staff and authentic atmosphere throughout the building will make you a return customer. If you plan to be taco-ed out by the end of the night you have to stop at El Mez. Order online and pick up your tacos or dine in at Paco’s Tacos in Stoughton, Wisconsin. They offer a modern approach to traditional Mexican food—including their famous Paco’s Taco. Paco’s Tacos only uses the freshest of ingredients bringing you the highest quality cuisine. Tons of dinner options to choose from will keep even the pickiest of eaters at bay. Stop by Door County’s only food truck for a truly local experience. Burritos, nachos, tacos, and handmade drinks. The Door County Pulse referred to Nistebox as “Door County’s Takeaway Lunch Box.” Find out why so many people love the Nistebox.